Practice Ignition is an accounting automation solution designed to help accounting firms simplify and streamline the accounting workflows and other related processes of their clients, managing all aspects of your accounting practice while you sit back and work on growing your client base. Aside from streamlining and accelerating your accounting processes, Practice Ignition is also equipped with the core capabilities of other business systems, including CRM (Customer Relationship Management), billing and invoicing, reporting, and project and proposal management. Robust, comprehensive, and powerful, Practice Ignition has helped many accounting firms and professionals become more efficient in their tasks, such as onboarding clients, initiate and pitch smart proposals, explore and assess unique insights among others. Practice Ignition enables you to create and tailored client proposals in a matter of minutes. The software helps you transition from manually creating and editing documents, a process that is extremely time-intensive as approvals take days (or weeks) to finalize and approve, to initiating and sending them to clients in just moments. Practice Ignition speeds up your payment-related workflows while ensuring the security of all information gathered and processed, such as client details, financial data, and others. Payment collection is fast as Practice Ignition automatically bills your clients based on their fee schedule and sends them the invoices from which they can immediately settle their incurred fees. Depending on what you prefer, you can provide multiple payment options to your clients to further accelerate the payment process. You can let them pay via Direct Debit, ACH and credit card. Practice Ignition provides you a schedule of incoming payments, helping you see the whole picture of your cash flow and know when incoming funds are due. No need to run after overdue invoices. Business insights are crucial in gauging the performance of your firm as well as deciding on which direction to take to further grow your business. With Practice Ignition, you are able to see powerful, reliable business insights in real time. You can make accurate revenue forecasts, know where revenues are streaming from and how to maximize them, and determine objectives and goals that you want to achieve. What Problems Will Practice Ignition Solve? 1. Practice ignition creates digital engagement letters and we map all the client data and services based on information used upon creating the lead. The software helps accounting firms graduate from manually creating and editing engagement letters, saving them time and effort that they can channel on other matters. 2. Practice Ignition utilizes its own payment gateway and embeds it directly into the digital proposal sent out of practice ignition. This saves an accounting firm close to 4 weeks setup time, and magically combines two processes into one by embedding the payment collection into the digital form. 3. Practice ignition solves the pain by utilizing the data captured during the engagement letter creation to surface real time insights that an accounting firm can action. 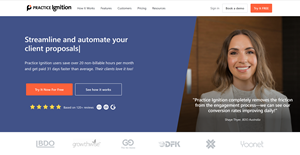 Things like monthly recurring revenue, conversion rate, projected earnings per annum, the number of new client sign ups and more, Practice Ignition provides real time information to accounting firms that allow them to make better decisions and zero in on key KPI’s of value. There are trendy and widely used solutions in each software group. But are they necessarily the best fit for your company’s specific requirements? A trendy software product may have thousands of customers, but does it provide what you require? For this reason, do not blindly invest in popular systems. Read at least a few Practice Ignition reviews and consider the aspects that you wish to have in the software such as the fees, main features, available integrations etc. Then, shortlist a few apps that fit your wants. Check out the free trials of these apps, read online reviews, get information from the maker, and do your research thoroughly. This in-depth groundwork is sure to assist you find the most excellent software solution for your organization’s unique wants. How Much Does Practice Ignition Cost? We realize that when you make a decision to buy Accounting Software it’s important not only to see how experts evaluate it in their reviews, but also to find out if the real people and companies that buy it are actually satisfied with the product. That’s why we’ve created our behavior-based Customer Satisfaction Algorithm™ that gathers customer reviews, comments and Practice Ignition reviews across a wide range of social media sites. The data is then presented in an easy to digest form showing how many people had positive and negative experience with Practice Ignition. With that information at hand you should be equipped to make an informed buying decision that you won’t regret. What are Practice Ignition pricing details? What integrations are available for Practice Ignition? It's super simple to use and it feels like it's been built specifically for accountants. I love it. If you need more information about Practice Ignition or you simply have a question let us know what you need and we’ll forward your request directly to the vendor.